If the world goes crazy for a lovely fossil, that's fine with me. But if that fossil releases some kind of mysterious brain ray that makes people say crazy things and write lazy articles, a serious swarm of flies ends up in my ointment. Criticism of excessive media hype about a fossil discovery, from blog 'The Loom' (19 May 2009) on Discover magazine website. 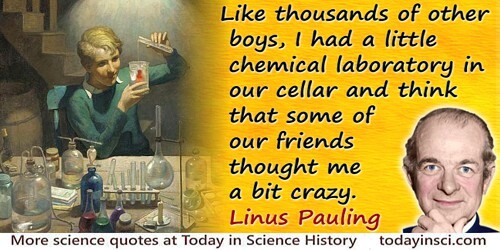 Like thousands of other boys, I had a little chemical laboratory in our cellar and think that some of our friends thought me a bit crazy. Quoted in 'Langmuir Winner Stumped Einstein”, New York Times (23 Aug 1931), N2. People ask me often [whether] the Nobel Prize [was] the thing you were aiming for all your life, and I say that would be crazy. Nobody would aim for a Nobel Prize because, if you didn’t get it, your whole life would be wasted. What we were aiming at was getting people well, and the satisfaction of that is much greater than any prize you can get. Quoted in Colin Wilson,New Pathways in Psychology: Maslow and the Post-Freudian Revolution (1972, 2001), 155-56. We all agreed that your theory is crazy. The question which divides us is whether it is crazy enough to have a chance of being correct. In The Ambidextrous Universe by Martin Gardner (1964). Your theory is crazy...but it’s not crazy enough to be true.